At the suggestion of a friend, I am posting a tutorial on how to make a nice watercolor painting using plastic stencils! It really is quite a simple process and you end up with something that looks professional. I love sharing these little secrets with people. It's fun! Step 1: Pick out the stencil you want to use and place it on top of your paper. Step 2: Hold the stencil down tightly with one hand. With your other hand, load up the paintbrush with water and paint and dab some on the paper inside the stencil area. Make sure not to move the stencil until you are completely finished. Step 3: To give it a varied look, add several different colors in random areas of the stencil. Wet watercolors will mix together on the paper- plus it's fun to watch! Step 4: Fill in the entire area of the stencil and ever so carefully lift the stencil away from the paper. Step 5: Let your painting dry completely and there you have it... your own mini artwork! If you notice that your watercolors are bleeding around the edges of the stencil you can try mixing less water with the paints. The more watery the paint is, the more it runs and the harder it is to control. I've also noticed that the quality of watercolor paper can affect this tendency to bleed. Using a thicker, more absorbent paper will give you better results. Another cool trick you can try is to sprinkle Epsom salt on the wet watercolor painting like I did with the butterfly. When it dries, just brush the salt off. It makes a really cool texture! Wow that is so neat, and it looks really simple. Love that frog....you must have steady hands indeed to have mastered holding the stencil and not smudging the whole deal! BRAVO! This is a great tutorial. 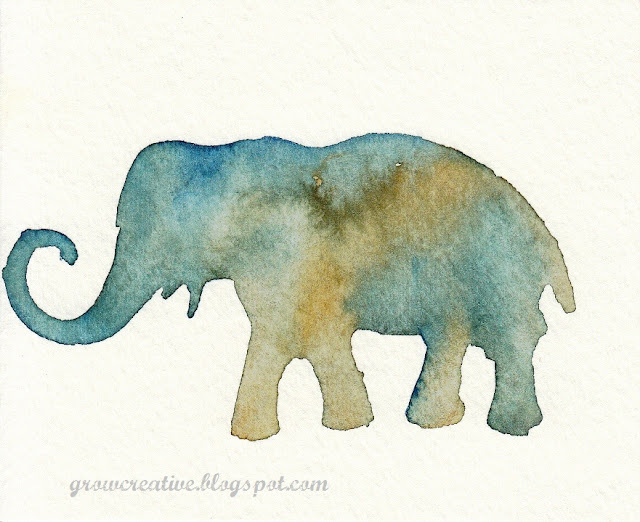 I love the elephant! I'm glad you did this! Brilliant idea. I have to give this a try. I particularly love the way the elephant and frog turned out. Thanks. What an awesome idea!! My daughter LOVES art. We'll be doing this for sure! Thanks for the great tip! Great idea, these would look great framed in a kids room! Can't wait to try! Just pinned this. I love the outcome, and I think my kids would really enjoy it. Thanks for sharing. So cute. Great project to do with kids! What a smart idea! I love how you can mix so many colours together. If you're looking for another place to share your awesome tutorial, I'd love for you to stop by Etcetorize to join the party! (http://etcetorize.blogspot.ca/2012/04/make-it-great-monday_15.html) Hope to see you there! How do you keep the paint from bleeding under the stencil? Mine keeps bleeding around so the shape doesn't remain. Wow...They are lovely!!! I love anything water color. I will have to give it a try! Alexandra- you don't have an email to reply to, so I'll answer your question here and hope you read it.... the more wet the paint is the more it spreads. You could try not mixing so much water with the paint so that you have more control. Also, I make sure to hold the stencil down very tightly around the edges I'm painting. I hope this helps- best of luck! Just to let you know I featured your wonderful project on homework today. Stop by and grab a featured button. Thanks for linking up your project - have a wonderful weekend. I just love this idea! and it's so easy to do! I can't wait to try it! Thanks. Love, love, love this!!! So many ways to use it. These are beautiful. I especially think they would look nice in a playroom or child's bedroom. Found you at The Shabby Nest frugal friday. Love your work and this wonderful project! The possibilities are endless. Thank you so much for sharing. I've been experimenting with paint techniques and can't wait to try this one! What a great idea! I'll definitely have to try this! This would be awesome in a nursery...pinning it for my next little one. I just did this with my boys and the results were wonderful! Thank you so much for the inspiration! Wanted to let you know that I just mentioned your blog and this post in my recent blog post...Thanks again!!! This is so pretty! I've been looking for something just like this! Thanks! Totally trying this, such a great idea that I would have never thought of! I will be making a Christmas Cards using your idea! Thanks so much for sharing! I simply must do this!! Pinning! These are really cool. I haven't painted in years, but this has me wanting to pick up a brush again! Thanks for the inspiration! What an awesome tutorial! I'll be pinning this for sure! Pinned it and will do it! I really love your water color. I too love art (water color mixed media) craft, fashion, cooking and vintage. Check out my blog. I am your newest follower. would you follow me back? Thank you so much...I am pinning this! Do you remember where you got this stencil? Yes I do! It was at a Dollar Tree Store- that was a few years ago so I'm not sure if they carry those anymore or not. Good luck! That's great! I hope you do find a stencil! This looks like something you would buy in a store! I just love the watercolor effect!